Spoiler-free Synopsis: On a dark and stormy night, three strange visitors whisk away three children for an interplanetary adventure to fight an evil shadow that threatens the universe. Reason for Beginning: My fifth grade teacher had read it to the class, and I remember it being good. Since it’s apparently a classic of children’s lit and sci-fi, I was eager to revisit it. Reason for Finishing: It was refreshing to read a story that developed naturally, organically, without undue reliance on simple plot formulae. Would I reread the story? Sure, but not soon. It’s a fast read with some interesting ideas, and can be easily revisited. Took me about four days of casual reading to finish. Sharply paced. Good for reading in bed, when you are tired but want to fill your mind with some interesting adventure before drifting into dreams. Would I reread this author? Yes. She’s got good ideas, knows how to communicate them, creates charming characters, and has at least four other books in this loose series that I intend to read soon-ish. 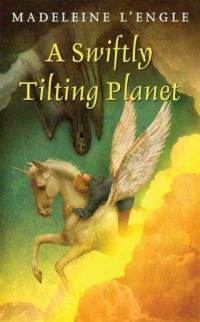 Recommendation: Especially for those interested in children’s novels and young-adult science fiction and fantasy. It’s also probably a great introduction to novel-reading for kids who haven’t been pulled in by the likes of Harry Potter and its copycats. But even for adults this book is good fun and has enough substance to make one think. As an adventure story with dashes of philosophy, A Wrinkle in Time is excellent. 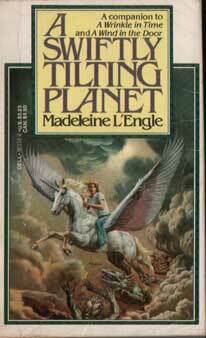 L’Engle has real ideas that she wants to impart, and she generally finds the right images and story elements to convey them. The book’s pace never lags nor seems hasty. Just the right amount of character and setting development is given before the story launches into its exciting premise. 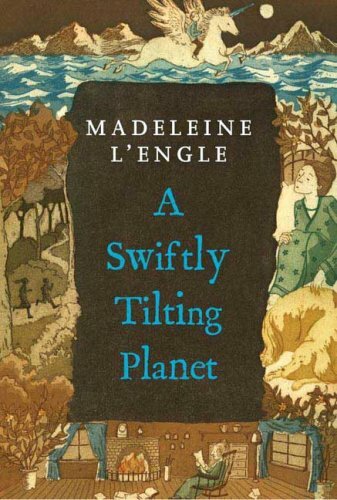 In her descriptive style, L’Engle mentions only details that are important or helpful, and does not waste her readers’ time with unnecessary diversions. She generally knows what she wants to say, and says it in a focused and entertaining manner. The characters are strongly defined and likable. Meg Murry represents what most preteen girls probably think of themselves, and her appeal is that of every awkward, good-hearted geek. “I hate being an oddball,” she complains to her mother, and repeatedly calls herself ugly or “repulsive-looking,” even though we are assured by her new friend Calvin O’Keefe that she has “dream-boat” eyes when she takes off her glasses. It was sweet to see the two of them become friends and, at least in Meg’s case, be utterly oblivious to the sparks of innocent first love. If I have one problem with Calvin, a physically gawky but sharply intelligent and perceptive boy, it’s that he seems extremely forward romantically with Meg. Their ages are never stated, but Meg appears to be about thirteen, and thus the older Calvin is about fifteen. Those two years are a huge gap, especially in the perception of kids that age, but Calvin has no qualms taking Meg’s hand without her permission, taking off her glasses to tell her she’s beautiful, or, later, outright kissing her. I suppose that’s just part of his character – that is, being fearlessly forward with people and never masking his feelings – but it feels a little jarring, considering his age. Meg’s little brother Charles Wallace has a similar problem from my view – I like him well enough, but L’Engle states that he is five years old, when his diction and ability to conceive complex ideas is that of an adult (think Calvin from Calvin and Hobbes, but not played for comedy). Of course he is supposed to be a special genius, possibly telepathic, but five years still feels too much a stretch– I’d accept him easier if he were closer to eight or nine years old. Still, I like them both, especially Calvin, whose good sense and moral strength make him an interesting character and a good model for young boys. At times it felt like A Wrinkle in Time utilizes a cosmology borrowed from C.S. Lewis’ Space Trilogy and simplified for preteens, to the point where all the theological complexity of eldils, unfallen planets, Deep Heaven, and spiritual rebellion is reduced to a war between Light and Darkness. This is not a bad thing; the details and meaning of Lewis’ invented cosmology can be difficult to untangle even for sophisticated readers. Perhaps for this reason his trilogy has remained fairly obscure, even for his fans (Lewisians?). 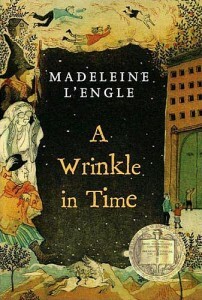 In A Wrinkle in Time young readers are introduced to the idea of every thing in existence being linked to each other naturally by the praise they give God, their Creator. The stars are angels that battle a Dark Thing that spreads like an inky shadow throughout the universe and who seek to inspire mortal creatures to fight it also, whether or not the mortals realize it. Meg, Charles Wallace, and Calvin are shown the Dark Thing engulfing Earth and are told that it cuts off a planet’s possibility of communication with other planets and retards intellectual and creative growth. On the alien planet of Camazotz, this Evil is given a personality and a pounding rhythm by which it seduces people to give up independent thought and surrender their wills to its purposes. It thrives on anger, fear, and despair, and the only way to defeat it is through…love. ‘“Who have our fighters been?’ Calvin asked. ‘Oh, you must know them, dear,’ Mrs Whatsit said. The qualifications for being a great fighter of the Powers of Darkness seem to be fame, notable accomplishments, and being counter-cultural – yet none of these are intrinsically good traits, morally. L’Engle lists Jesus alongside men who did not live their lives to glorify God, and by implication equates them. Jesus, of course, was no mere moral teacher, but L’Engle neither highlights His uniqueness as the Son of God nor explores what spiritual good, if any, exists in the lives and works of the other men. This is highly disappointing. From a purely literary perspective her point is not developed enough, and from a Christian perspective it is rather alarming. A Wrinkle in Time is a fun and fascinating little book, a theological science fiction adventure fit for bright children and anyone older. 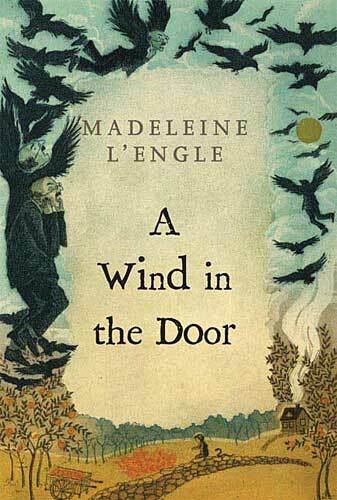 In the following books of the Time Quintet I hope to see how L’Engle develops her cosmology and her endearing family of characters.